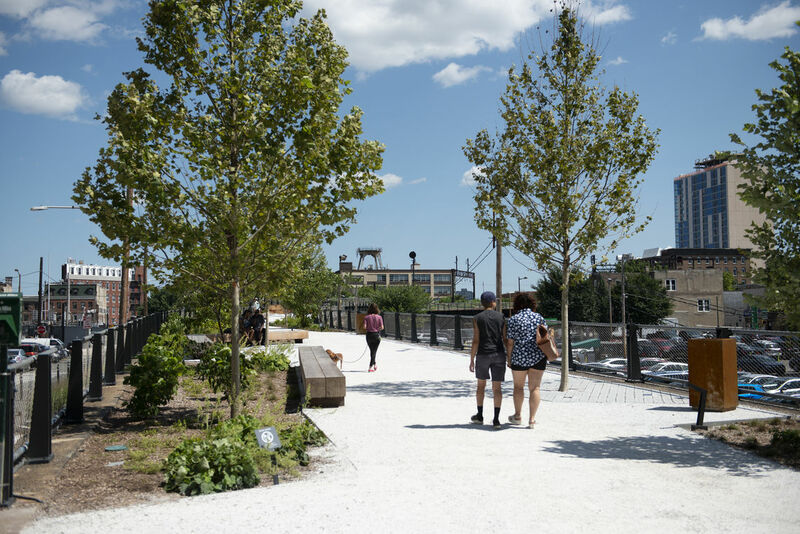 The Rail Park is a transformational project that introduced 25,000 SF of community and green space to a mixed-use Philadelphia neighborhood which lacked both. 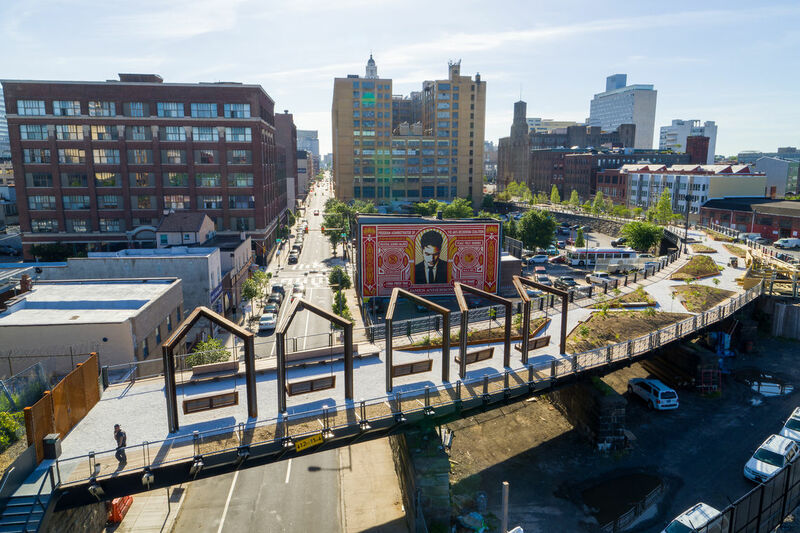 A blighted section of the former Reading Railroad Viaduct in Philadelphia has been transformed into the $10.8 million elevated Rail Park, bringing much-needed green space to the expanding Callowhill and Chinatown neighborhoods. 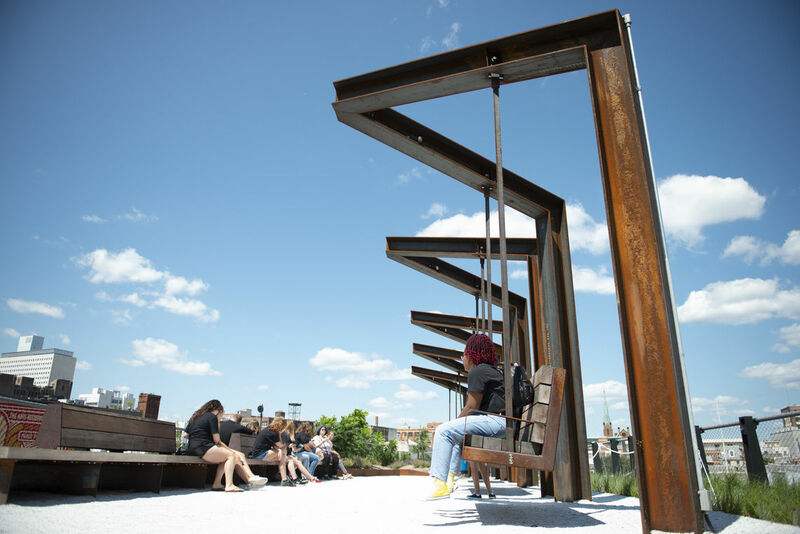 Opened in 2018, the park covers one block of Noble Street and offers walking paths, landscaping, 10-seat swings, seating, and views of downtown and surrounding neighborhoods. 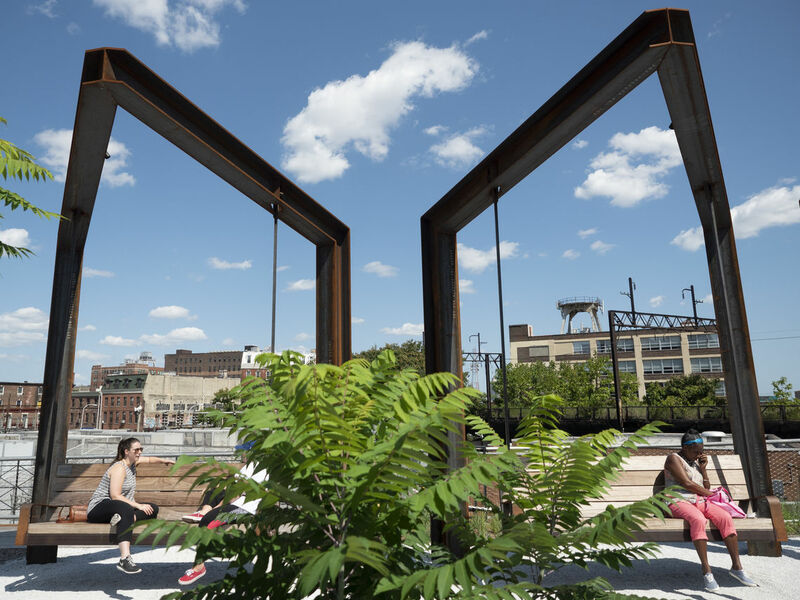 Center City District aims to expand the park in the future, using the first phase as a model. Urban has supported this project since 2011. 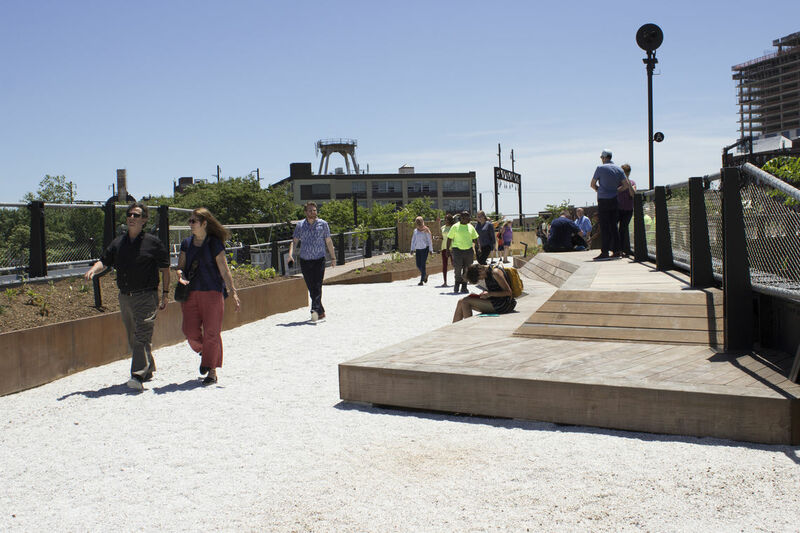 We conducted the initial concept design study, in partnership with the architect, community stakeholders, Center City District, and the City’s Commerce, Parks and Recreation, and Streets departments. 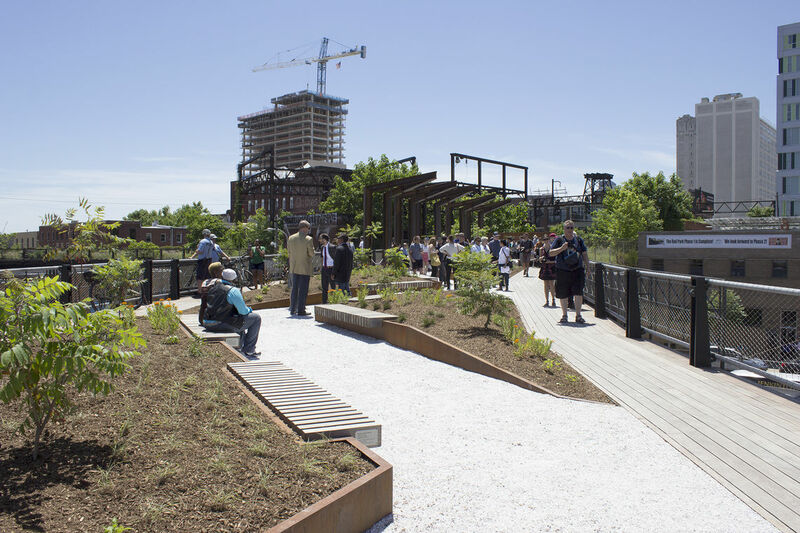 Repurposing the SEPTA-owned spur of the viaduct, the design reflects the community’s desire for green space with an industrial aesthetic linked to the site’s former use. The viaduct is located in a rapidly developing section of the city. 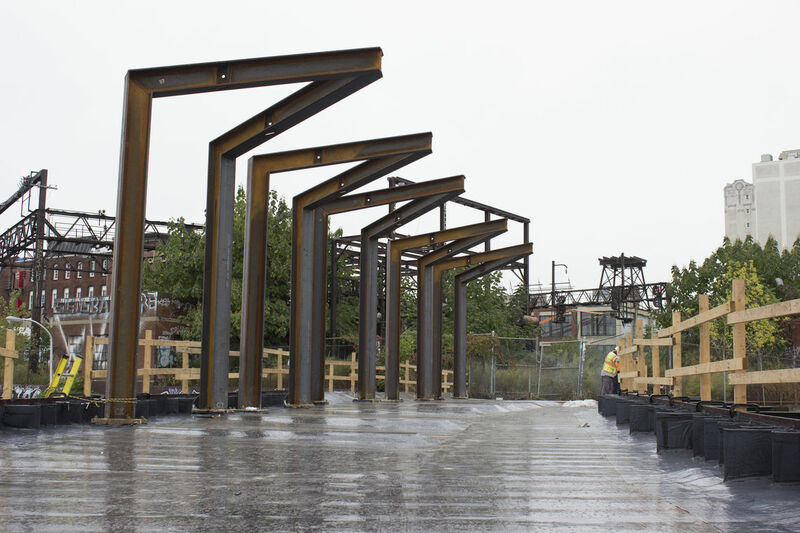 To achieve the community’s goals, several old steel bridges were repurposed. 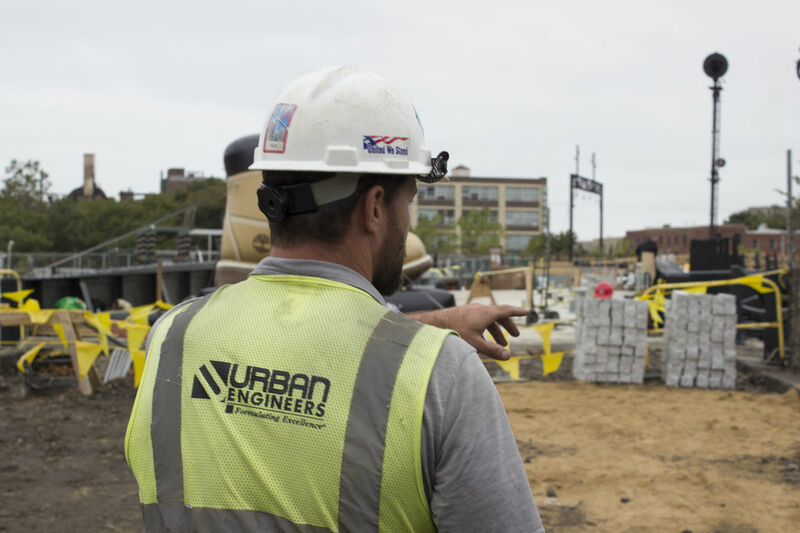 Urban completed environmental investigations of soil and implemented corrective actions. 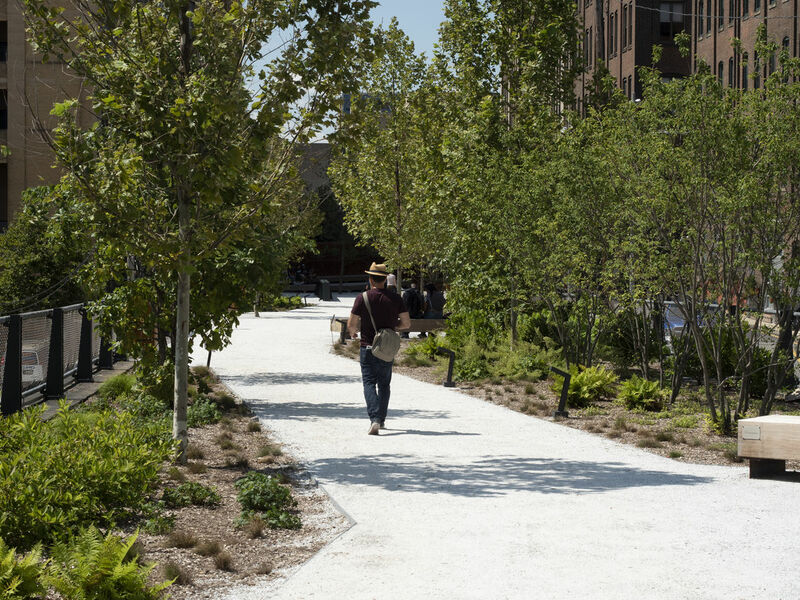 We also designed reinforcements and surface improvements to transform the former railway into a landscaped pathway. 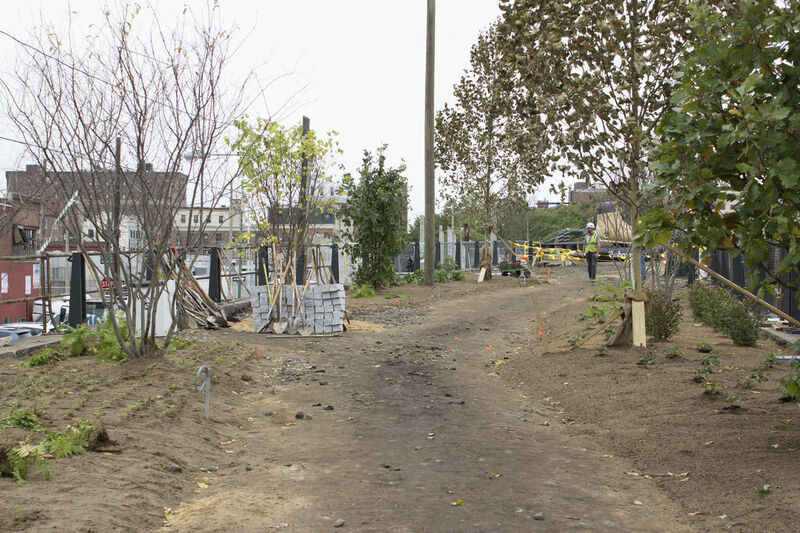 To support the park’s landscaping, we designed a new drainage system. 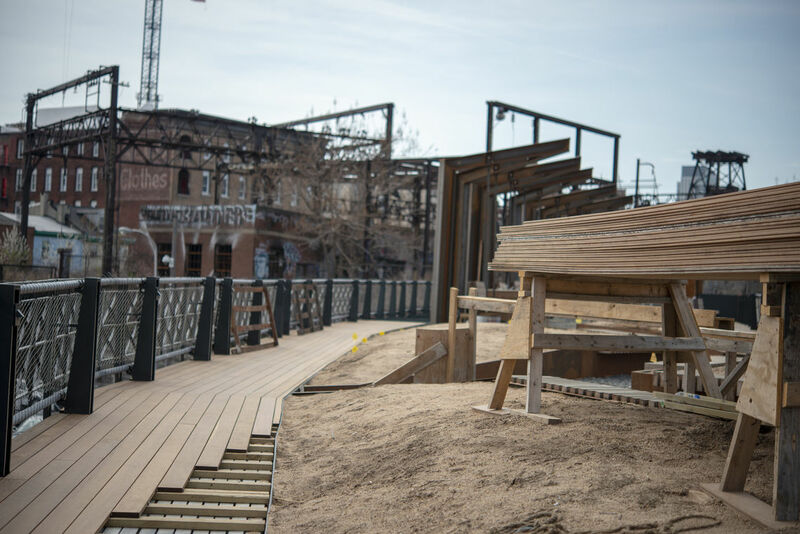 Constructing the park on existing steel bridges involved attaching new structural steel to the old steel superstructure, painting the existing steel, and placing pavement on the cobblestones and rails in the streets. 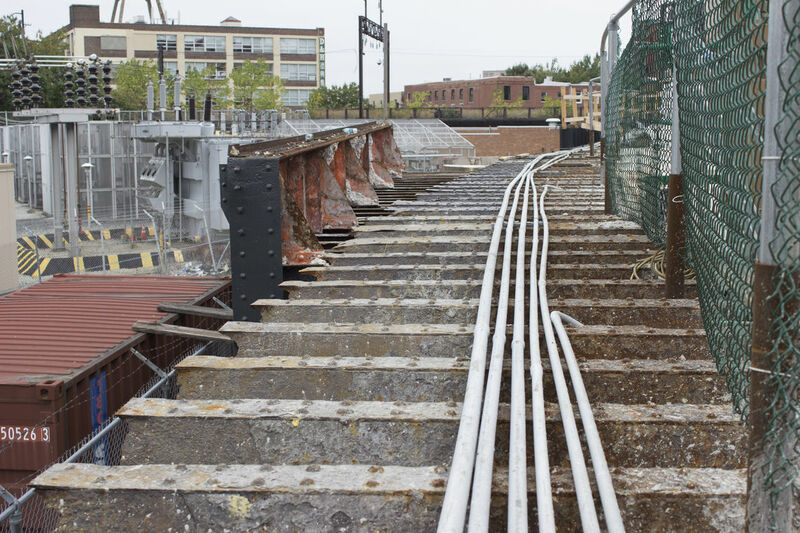 Architectural elements and materials of similar industrial scale and character to the original structure were used for the platforms, benches, and guardrails. 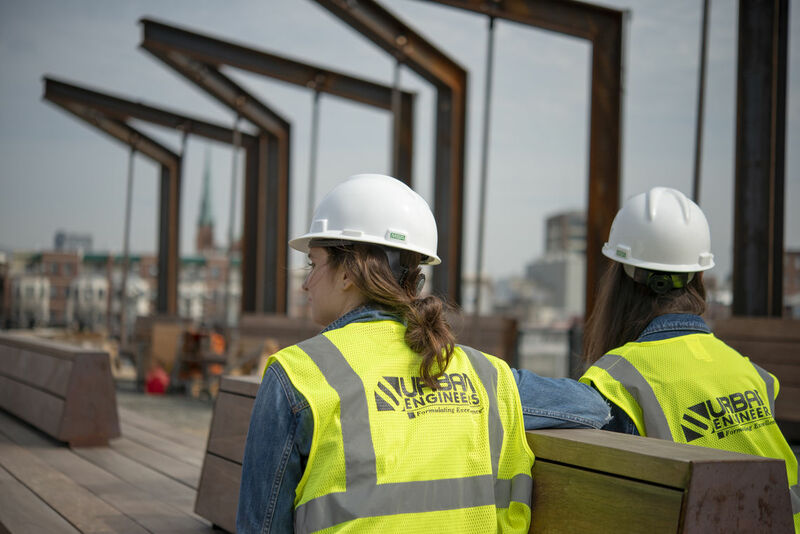 Materials, such as the Ipe hardwood which composes benches and platforms, was selected for durability. Ipe is scratch-resistant and nonflammable. 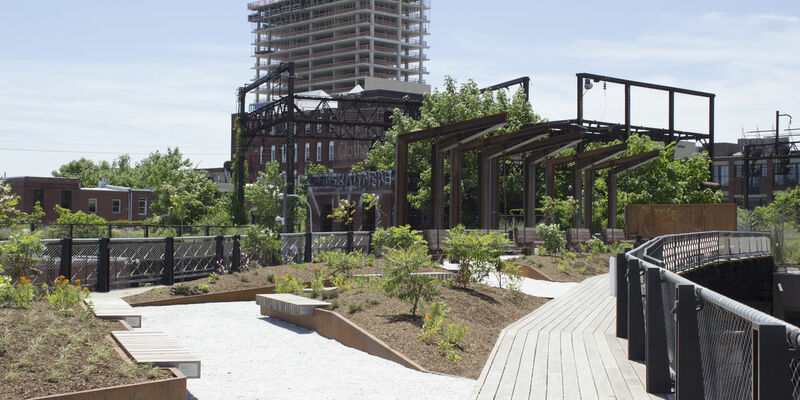 Varied vegetation helps convey the rugged character of the former viaduct while meeting Philadelphia Water Department’s Green Stormwater Infrastructure requirements.